Crawler type mobile crushing plant is the first choice of processing construction waste. The new crawler type mobile crushing plant takes advantages of excellent performance, attractive appearance and safe operation. Vibrating feeder, circular vibrating screen, belt conveyor, crushing machines consisting of jaw crusher, impact crusher, cone crusher and impact crusher, all can walk on the each place by crawler driven by full hydraulic system. According to the kind of material, you can choose coarse crushing system and fine crushing system to finish single unit full strategy independent operation or configuration unit combined operation. 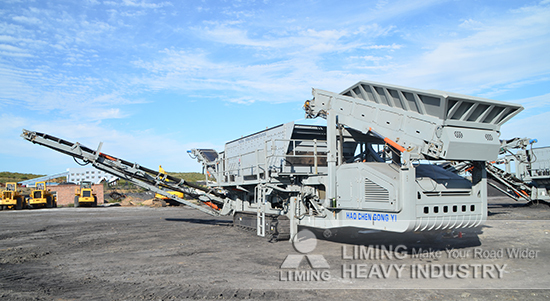 Adopting integrated group operation mode, crawler type mobile crushing plant can put into operation quickly as soon as it reach production site, which greatly reduces transportation costs because the materials can be crushed directly rather than transported first and then crushed. There are many configuration schemes can be choose, and we will provide tailored solutions according to on-the-spot investigation, so crawler type mobile crushing plant is a good choice for processing construction waste. In addition, the environmental performance can reach national standards very well, because there is low noise and little dust during production, and it won’t affect the environment and living condition. At present, a large of construction waste projects need to do, so there is a wide investment prospect.